Dr. Silvers recommends everyone screen his own entire body every three months by using two parallel mirrors to look for any pink or red spot that has not healed beyond four weeks. To screen for a melanoma, search for any brown spot that is different, and is in any way appearing bizarre, when compared with the other moles of the person that is being screened. How often should a person have a full body mole check done by a dermatologist? It depends on the types of moles a person has, history of severe sunburns, presence of moles on the feet and buttocks, and history and family history of skin cancer. How is it that sometimes a dermatologist can tell with certainty that a mole is benign by just visual examination? The knowledge of dermatopathology, i.e., how moles look under the microscope, equips dermatologists with great insight. And, then, some daily experience. Dr. Silvers examines the moles with magnifying glasses. 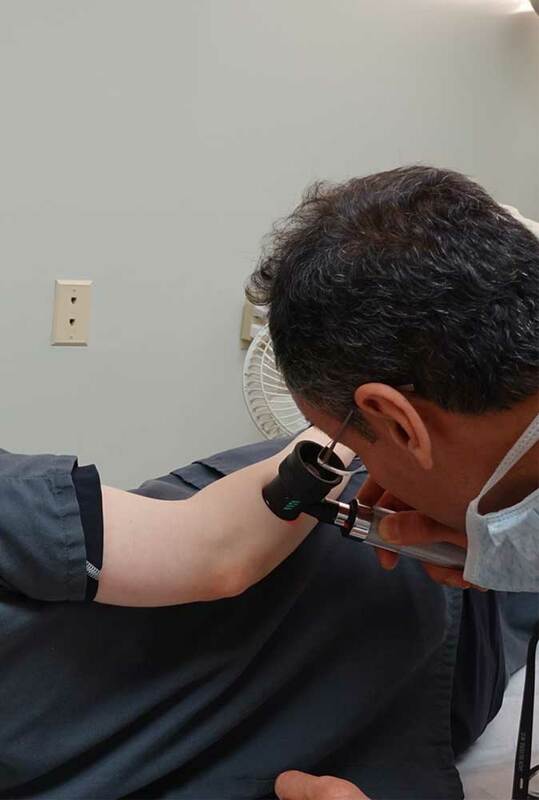 If a mole appears slightly suspicious, he then examines it more closely using a dermatoscope, and, if need be, he biopsies the mole, leaving minimal to no scar. Taking skin biopsies, and removing moles with practically no permanent scar are Dr. Silvers forte.